SEWER LATERAL INSPECTION - Benton's Plumbing Company, Inc. In January 2012, the City of Ventura adopted new regulations to support the inspection, repair and replacement of private sewer laterals. 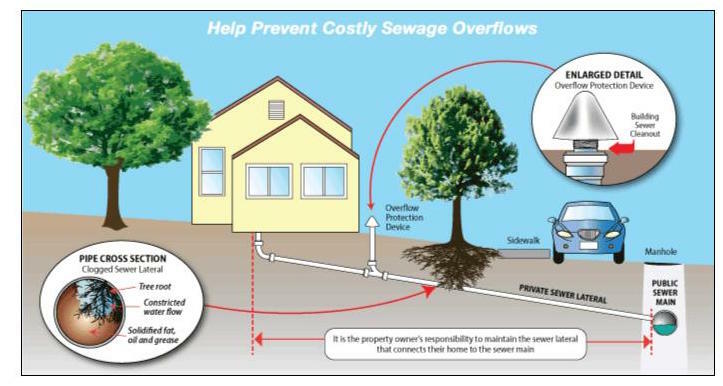 A private sewer lateral is the pipe that connects a business or home’s plumbing system to the City’s main wastewater collection pipeline. The lateral is considered the “private” segment when it is located on private property and serves the purposes of an individual, privately-owned building. The property owner is responsible for entire pipe length, including the wye or saddle at the point of connection to the City’s mainline. Ventura Water is responsible for the maintenance of the main pipelines that carry used water from homes and businesses and to protect public health and safety, these pipes are regularly inspected and repaired to maintain their integrity. With thousands of private sewer laterals in the City, property owners are important partners in assuring that pipes are properly maintained to protect us all. For more information on these regulations visit http://www.cityofventura.net/water/privatelateral. We can conduct a complete sewer lateral inspection using our high definition cameras.